In the meantime I'll just satisfy myself with our virtual friendship and drooling over her amazing creations! You guys have already been introduced to one of her brain childs (brain children? )-these cookies that I made and then adapted! Yeah. So. You see why I love her! Anyway, enough of my gushing, Ashley: over to you! Greetings all! I'm Ashley from Baker by Nature, and I am beyond thrilled to be guest posting for Kayle today. I'm lucky enough to have met Kayle in real life, and she is just the sweetest little thing! I will miss her in NYC very much. Wah wah waaah. I think we need something sweet! Let's talk cookies :) I made these especially for you! They're soft in the center, chewy on the edges, and packed with goodies!!! 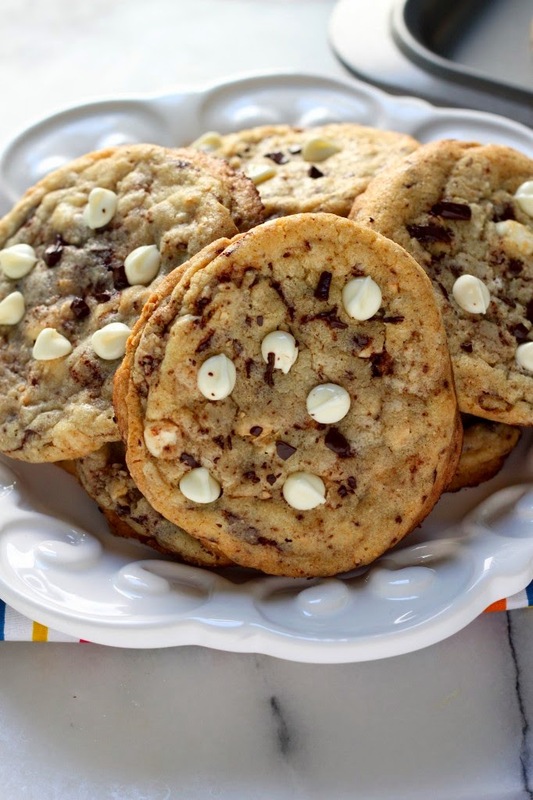 These goodies include white chocolate chips, dark chocolate chips, and salty cashews. I am obsessed with adding salty ingredients to my sweets lately! Have you guys tried it? Preheat oven to 350 degrees (F). Line 2 large cookie sheets with parchment paper and set aside. In a medium-sized mixing bowl whisk together the flours, baking soda, baking powder, and sea salt; set aside. In the bowl of a stand mixer fitted with the paddle attachment beat butter on medium speed for one minute. Add the vanilla and sugars and continue to beat on medium speed for another 3-4 minutes, or until light and fluffy. Add the eggs and beat for 30 seconds – the eggs will not be full incorporated; it’s ok. Turn the mixer on low and gradually add the dry ingredients, beating just until combined. 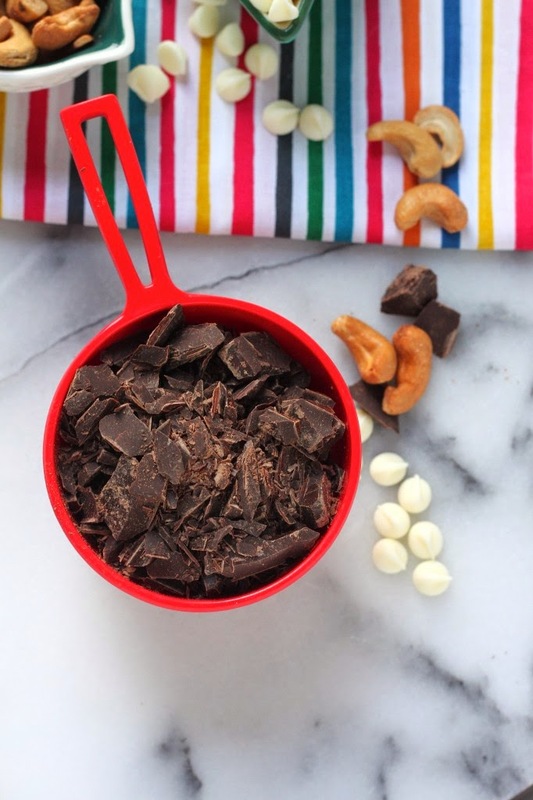 Sprinkle in chocolate chips and cashews. Scoop 1/4 cup balls of dough onto prepared baking sheets. 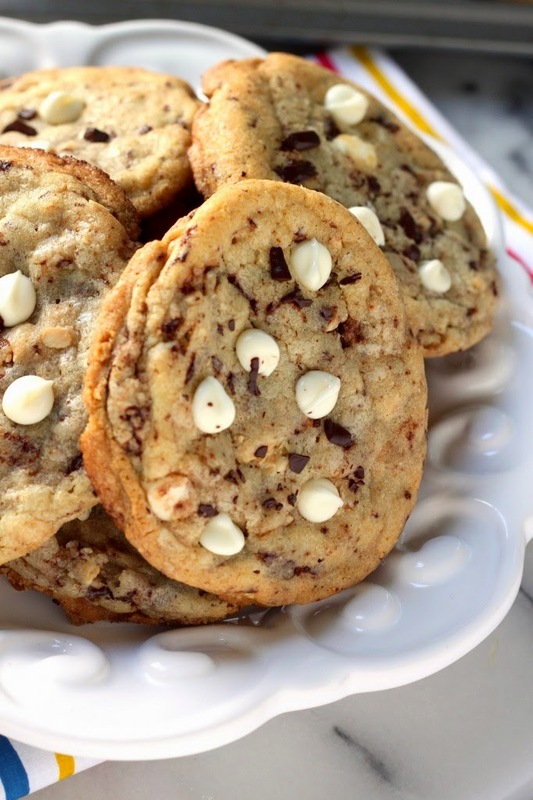 Lightly press each cookie with the palm of your hand, then press in additional chocolate chips if desired, dividing them among all of the cookies evenly. 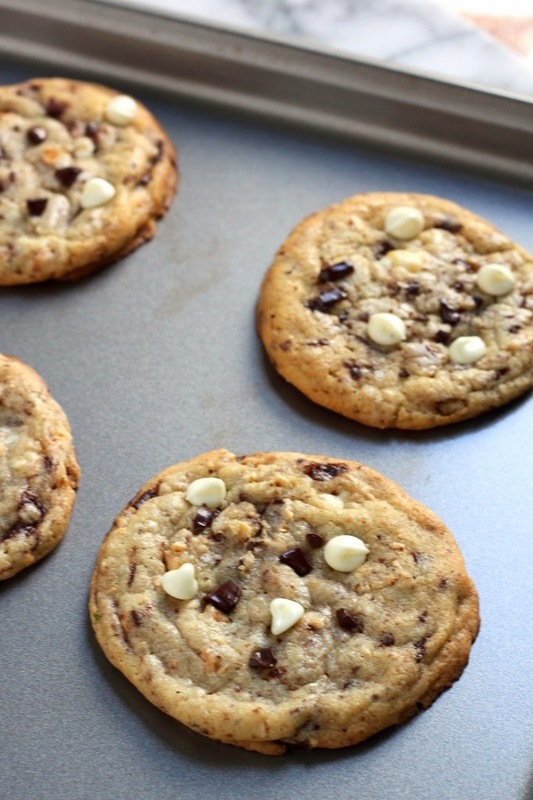 Bake the cookies for 16 – 18 minutes, rotating the pan halfway though for even baking. Cool cookies on the pan for 5 minutes, then transfer them to a wire wrack to cool completely. YUMMEHHH! Thank you so much Ashley! Now, go follow Baker by Nature! !